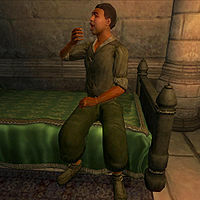 Kellen is a Redguard commoner added by the Knights of the Nine official plug-in. He can be found at the Chapel of Stendarr in Chorrol, where he is involved in the quest Stendarr's Mercy. He is a descendant of Sir Casimir. Although his ancestor was from Cyrodiil, Kellen seems to have come from Hammerfell to seek the care of those working at the chapel in Chorrol. Kellen wears a collared shirt, green felt linens and a pair of buckled shoes. After the completion of his related quest, Kellen begins a rotation of travel between all cities except the Imperial City. He starts his travel to the next city every Morndas, Middas and Fredas and he will stay at the local inn. Anvil, where he will stay at the Count's Arms. Skingrad, where he will stay at the West Weald Inn. Bravil, where he will stay at the Lonely Suitor Lodge. Leyawiin, where he will stay at the Three Sisters' Inn. Cheydinhal, where he will stay at the Cheydinhal Bridge Inn. Bruma, where he will stay at the Jerall View Inn. Chorrol, where he will stay at the Oak and Crosier. Esta página foi modificada pela última vez à(s) 07h36min de 1 de junho de 2015.